One of the issues when working with leathers and vinyl materials is keeping the presser foot gliding smoothly across the surface without dragging; another is how to sew seams that are flat and bulk-free. 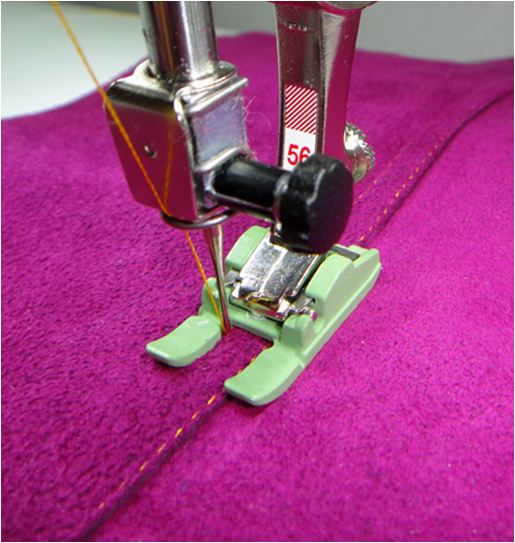 Here’s a presser foot that solves both problems: Non-Stick Open Embroidery Foot #56. This foot slides across surfaces that sometimes cause a metal foot to stick and drag. The coated sole works with any “sticky” material such as suede, plastic, vinyl, leather and microfibers. 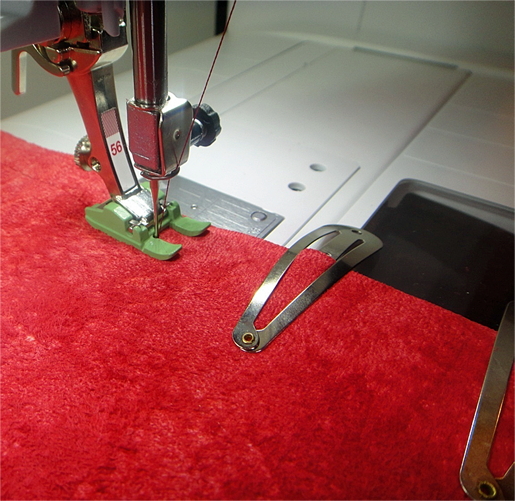 This open-toe foot also makes it easy to sew the lapped seams that are perfect for these types of materials. Not only are the seams flat and bulk-free, they are finished on both sides so no raw edges are exposed – great when sewing reversible projects! • Pins will leave holes that cannot be removed. Use tape or clips to hold pieces together for sewing and be sure that you are sewing in the correct place before stitching – there are no second chances. • Use a leather needle that has a “wedge-shaped” point for sewing leather. Note: This type of needle is for real leather only; use a Universal point on plastic or vinyl. 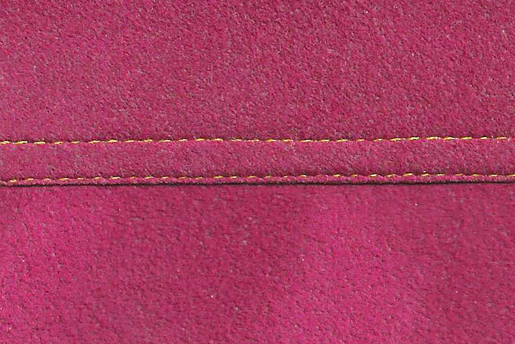 • Lengthen the stitch length to 4-5 mm to avoid perforating the leather or vinyl too closely. For more information on Open Embroidery Foot #56, download this a free Accessory Spotlight PDF at bernina.com. Next Next post: Thank You for Helping Us Reach 100,000 Facebook Likes! Susan Beck really knows her stuff. She was the facilitator at the “Foot Alphabet” in Aurora, IL. Thanks again Susan for this great technique.